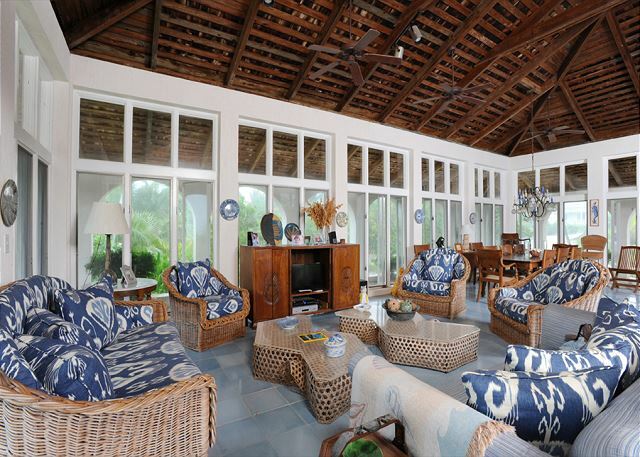 Welcome to Goodwind House, a spacious three-bedroom villa located directly on world-famous French Leave Beach, with a three-bedroom guest cottage 100 feet away. 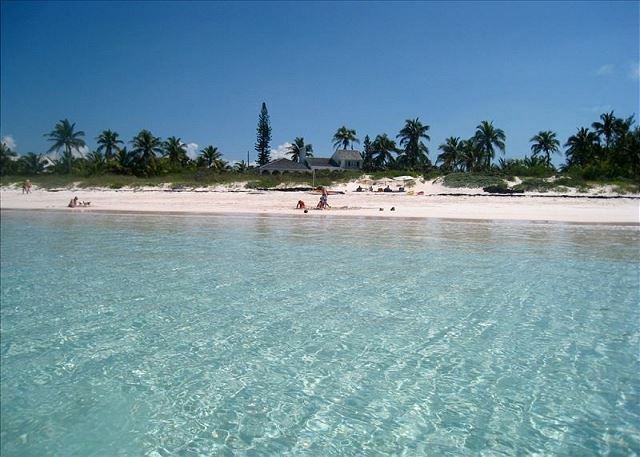 French Leave Beach is a pristine beach renowned for its pink sand and turquoise water. 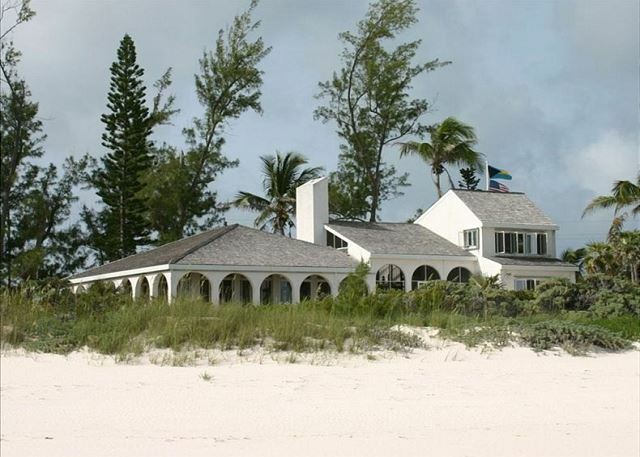 French Leave Beach is 75 yards wide and over a mile long, with only five houses on the entire length. 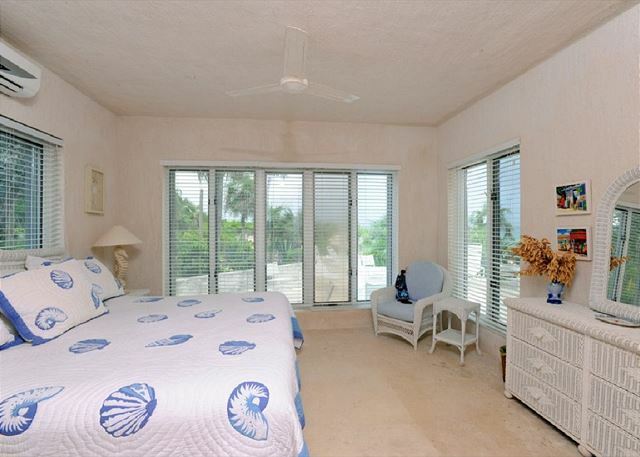 Goodwind has an abundance of glass for sweeping beach and ocean views from all major rooms. 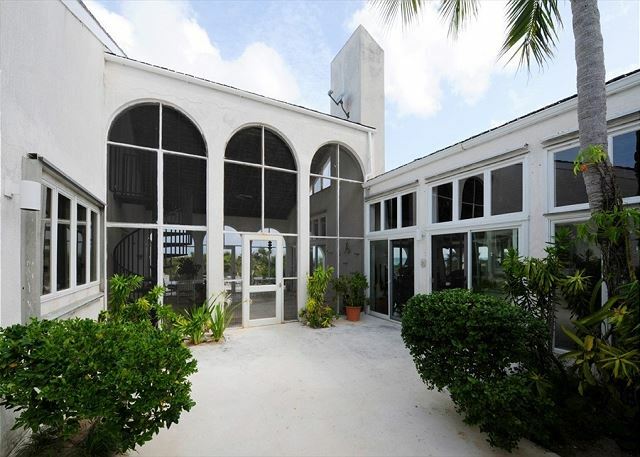 Enjoy the shifting hues and gentle sounds of the ocean from our generous screened and shaded verandas framed by elegant stucco arches. 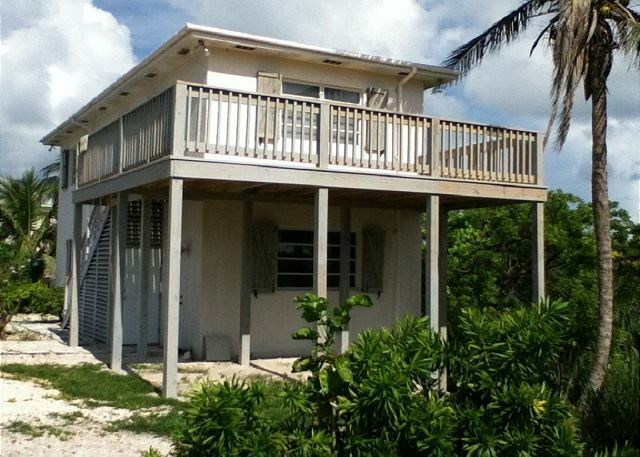 Goodwind House sleeps 6 in its three bedrooms. 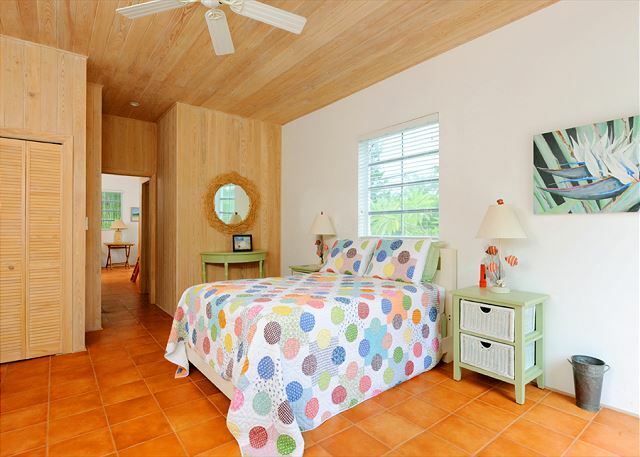 The guest house has three bedrooms, including a bunk room, and sleeps 8 more. 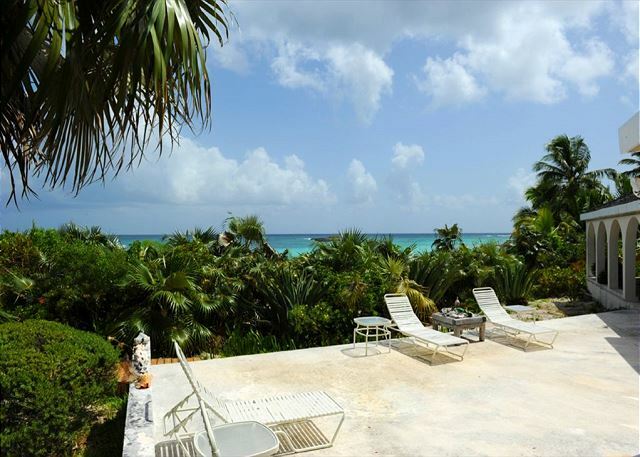 Goodwind house is located a mile from the town of Governors Harbour on historic Banks Road, the premier location on Eleuthera, famous for its grand estates. There is an excellent reef for snorkeling a short walk down the beach, inhabited by a wide variety of reef fishes. Goodwind House has a large light-filled great room with 360-degree views. 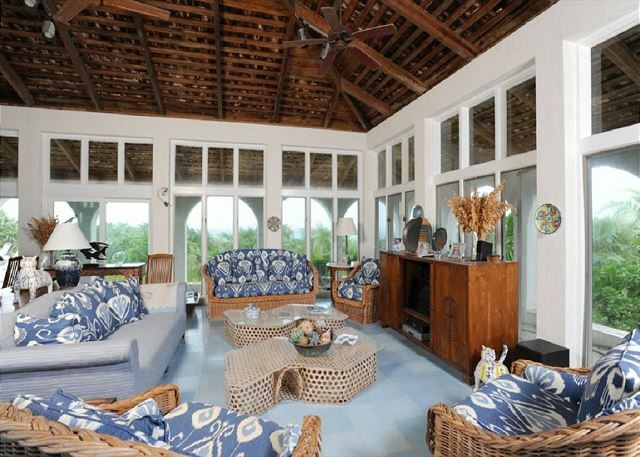 All the windows open to catch the ocean breeze, and there are six ceiling fans (no air conditioner in great room). The great room includes a dining area with seating for up to 12 guests and a complete wet bar with ice-maker. There is seating for fifteen in the living area, centered on an entertainment center with flat screen TV and a separate projects/game table. 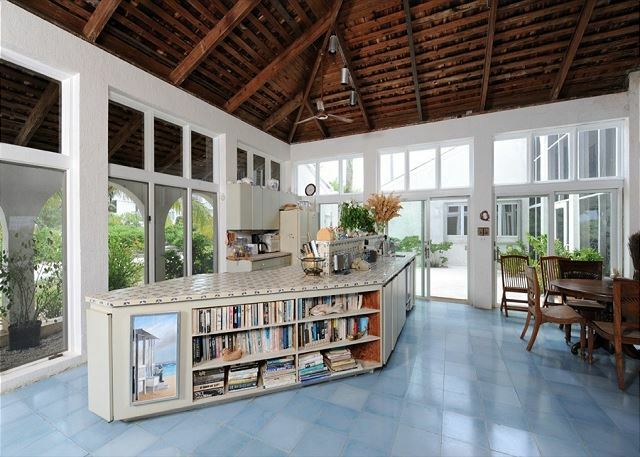 The fully equipped kitchen is open to the great room for those who wish to entertain while cooking. The spacious screen porch has dining tables with seating for ten. There is also a large hammock, beloved by the children. 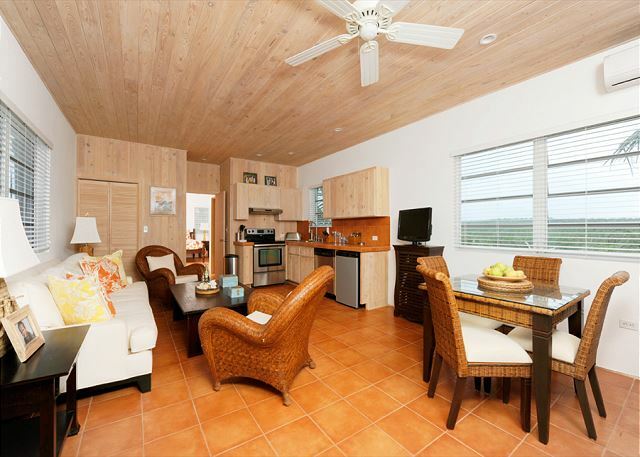 There is an open deck towards the sea furnished with four recliners with end tables between them, and nearby, a gas grill for outdoor cooking. 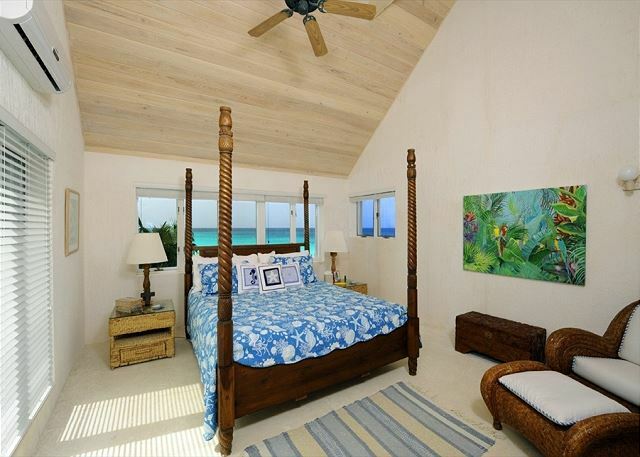 Goodwind House sleeps 6 in beds in its three bedrooms. 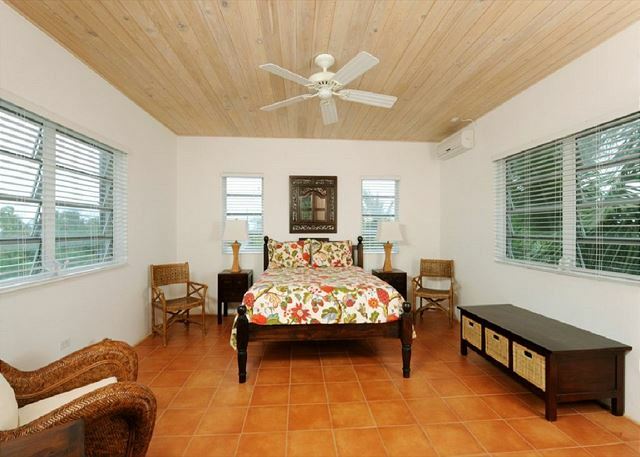 The three bedrooms are air-conditioned. The great room is not air conditioned. 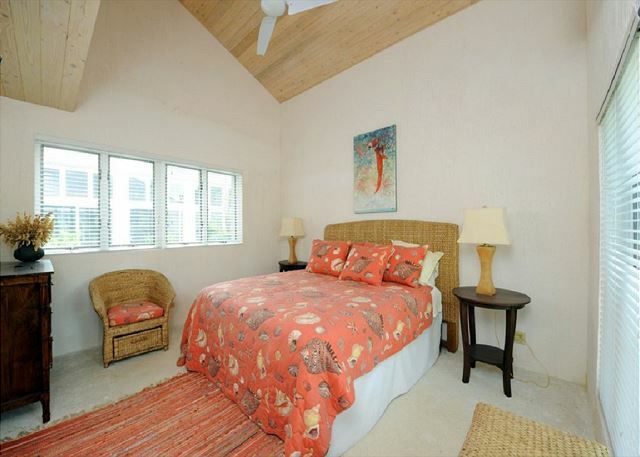 The upstairs master bedroom suite has a king-size four-poster bed, his and hers closets, and a large bathroom with a walk-in shower. Downstairs are two more bedrooms, both with king beds, and two more bathrooms, one with a walk-in shower and one with a shower-tub combination. There is also a laundry room with a washer and dryer. The guest cottage, called The Boat House, is located across a small road from Goodwind House. 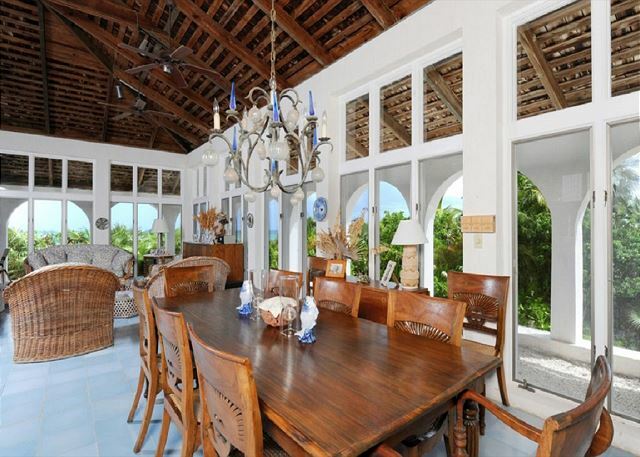 The upstairs, which contains the living room, dining area, kitchen, and one queen bedroom, has beautiful views of French Leave Beach and the Atlantic Ocean. 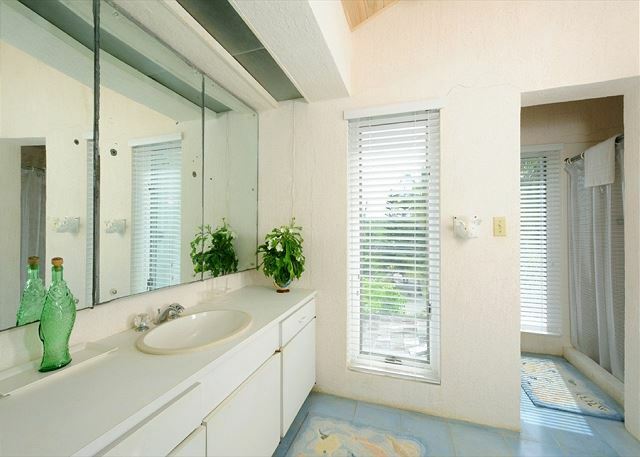 The upstairs also has a full bath and a laundry closet with washer and dryer. 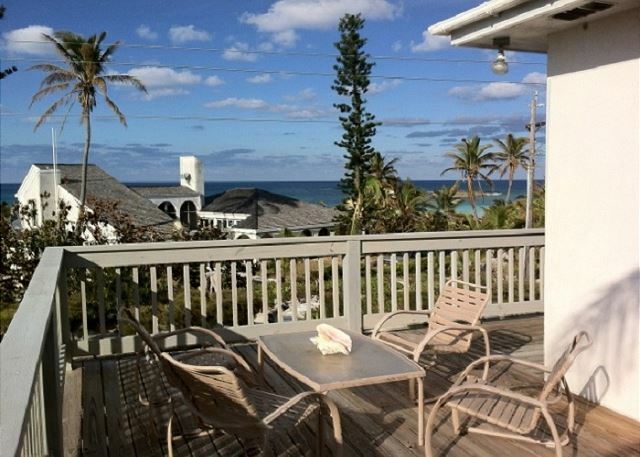 It also has a large furnished deck with ocean views. 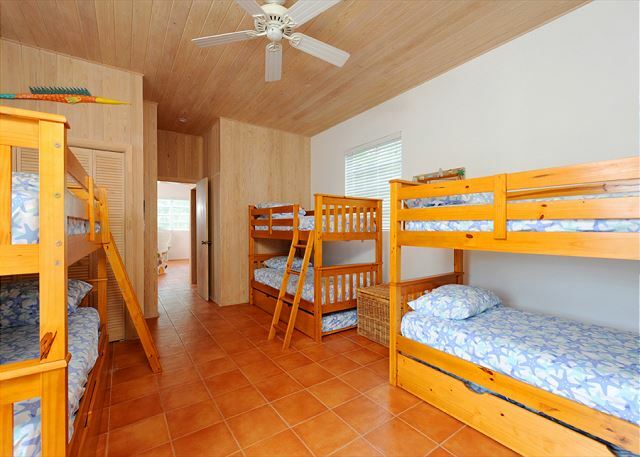 The downstairs contains a second queen bedroom and the Bunk Room, which sleeps 8 in three bunk beds and two trundle beds. 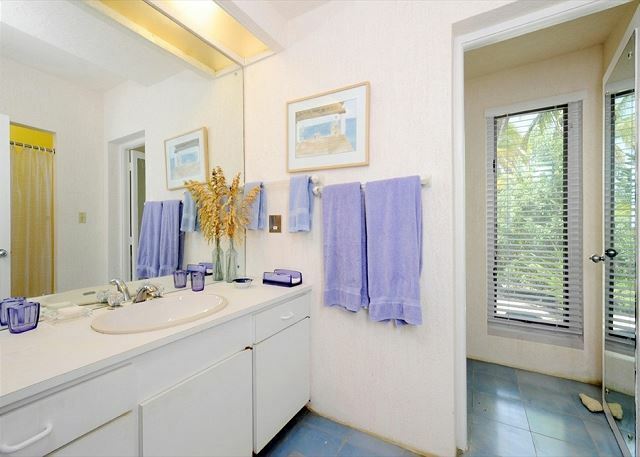 Both downstairs bedrooms have full en-suite bathrooms. Note that the upstairs and downstairs have separate entrances. The stairway between them is outside. 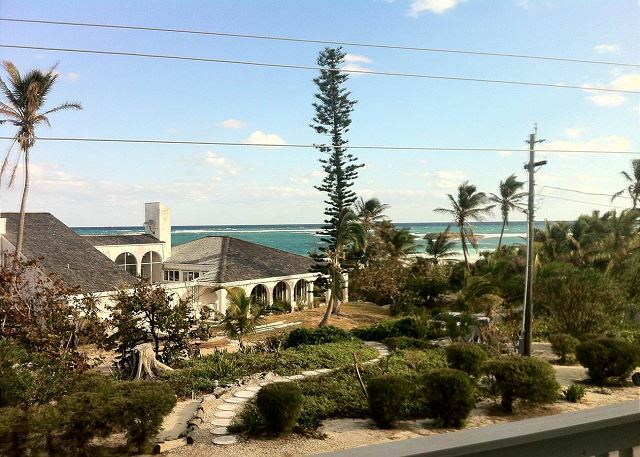 Amenities at both houses include WIFI, satellite TV, and a landline telephone for local calls. Goodwind House We have plenty of board games, toys, and books. 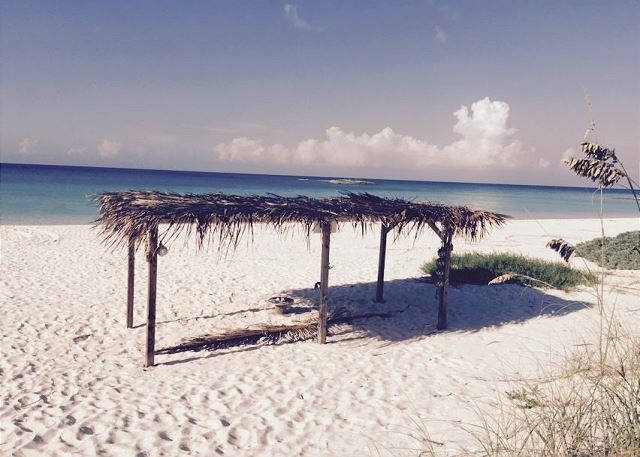 French Leave Beach is an idyllic, mile-long, crescent-shaped beach. 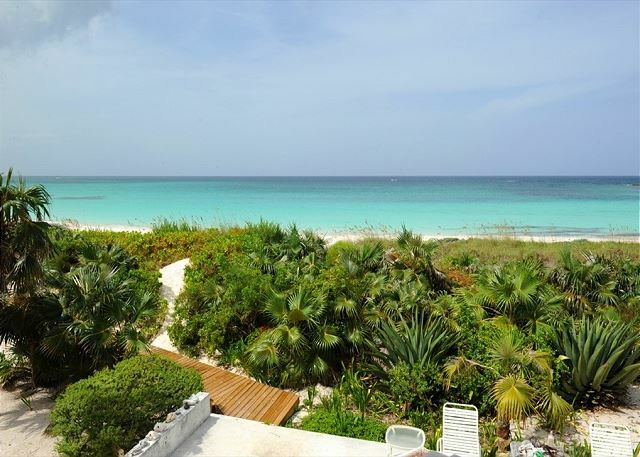 There are only five houses on the entire length of this spectacular beach. The surf is very mild, protected by a large reef system that parallels the shore. 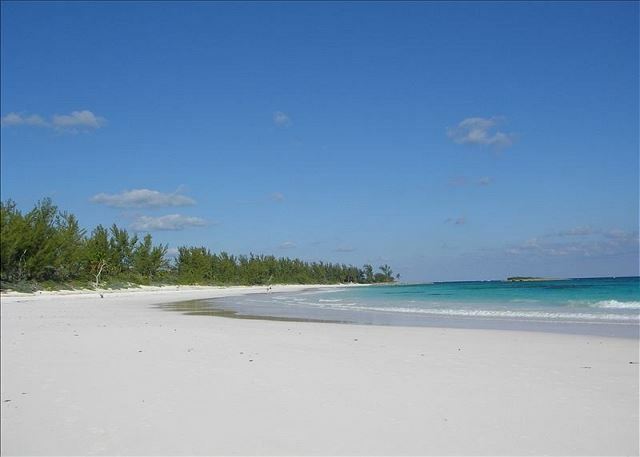 The water on French Leave Beach is literally crystal clear: with no rivers or streams on the island, Eleuthera's seas are free of sediment and among the clearest in the world. Tippy's famous beachside restaurant is just a mile away (you can walk the beach to get there), it offers fine dining and live entertainment.